With more and more people getting broadband Internet connections at home, there is a surge in the market of networking products aimed at this niche. For the last few years the major players have been Netgear and Linksys. What they offer is a simple-to-configure home Gateway / Router, which allows someone to simply take the Ethernet cable from the modem and attach it to a wan port. Once connected, you were able to share an internet connection with 1, 4, or 8 machines by simply plugging in your computer into on of the available LAN ports. You'd then have internet, email or any kind other kind of network access. The downside to these Gateway / Routers is that the feature list is very limited and if you wanted to host a game or an ftp server you would have to overcome the NAT firewall with port forwarding, which usually isn't in a beginners skill set. NexLand has brought a product to market that is the next evolutionary step in home networking, bringing features that you see in a corporate environment like a DMZ feature, advanced firewall features, and DNS. � Solid Reliability of Nexland Technology... No Freezes! 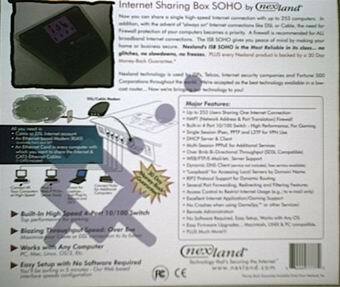 Now lets take a look at the Nexland ISB SOHO, first the front and rear of the box. The back of the box has a nice diagram of typical installation, what you need, and product specifications. 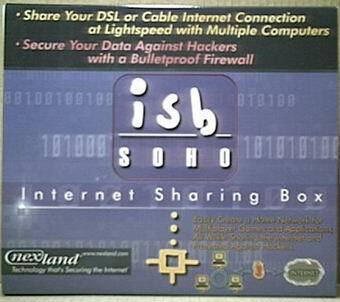 The contents are: ISB SOHO, 1 6.5' Cat5 Ethernet cable, 9v power adapter, CDrom with Internet Explorer 5.5, manual and help files, a fold out quickstart guide, and a user's guide.